If nothing else, I have to commend Stephen King for actually writing Doctor Sleep. I imagine it must be difficult enough to release a book that will be compared to The Shining and perhaps The Stand in terms of quality. But to actively invite it by writing a sequel after this long? That’s a bold move. Doctor Sleep, after a fairly brief prologue, catches us up to Dan Torrance somewhere in his thirties. Much like his father before him, Dan is an alcoholic. He’s attending the meetings, and working in a small town hospice where he uses his shining to help terminally ill people in their final moments. But soon his relative peace is disrupted when he meets the teenage girl Abra, who happens to have the strongest shining he’s ever encountered. Only it’s not Dan she’s managed to attract the attention of. A cabal of vampires who feed on the steam released when children with the gift are tortured are close behind, and they need Abra’s steam at any cost. If it’s not obvious already, Doctor Sleep is much wider in scope than The Shining was. I appreciated how much it added to the mythology of this universe. I don’t think any of it retroactively improves The Shining, but new inventions like the steam work well and seem to fit in nicely. Without a doubt however, my favourite parts of the book were the quieter moments when Dan was working in the hospice, or mentoring Abra on what her powers are. It’s these quieter moments where King’s strong characterisation really shines through (pun sort of intended). The relationship between Dan and Abra is especially strong. 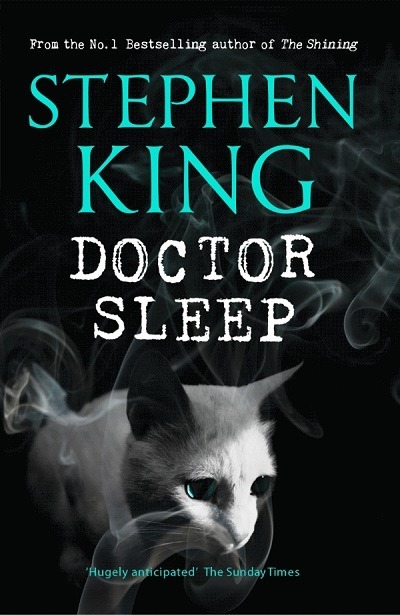 It almost surprised me, because I think in lesser hands a relationship between a middle aged man and a teenage girl would come across as Dan grooming her, but King’s had years of practice, and in Doctor Sleep it just seems like the most normal thing in the world. Heartwarming even, given their shared experiences. The parts I liked less were when the True Knot were involved. Don’t get me wrong, Rose the Hat and her crew are fun villains, and I very much like the idea of vampires disguising themselves as nondescript old people driving RVs and Winnebagos. It’s classic Stephen King. But they just weren’t scary or threatening. Having lived with an alcoholic parent, waiting through most of The Shining for Jack Torrance to flip the switch and start rampaging through the hallways was terrifying at points. But through Doctor Sleep, I never felt like the True Knot were ever set up to do anything but lose in the end, and so the suspense just wasn’t there. It’s a shame, because the idea of these people feeding off the literal pain of children is a good one. But the execution never quite lived up. For the first half, Doctor Sleep looked like it was on its way to being a four star novel. The second half, when things took a turn to focusing more on the True Knot, was when it lost me a bit. It’s never bad, but I almost feel like it could have been a more interesting book without them. As it is though, Doctor Sleep is a solid follow up to The Shining that starts and ends well, with a slightly lacklustre second act. It never quite reaches the heights of its predecessor, but it never totally disappoints either. I’d recommend it for fans of The Shining who want to know what became of little Danny Torrance when he grew up. This entry was posted in Book Reviews and tagged Books, Doctor Sleep, fifty books, Horror, review, Stephen King, The Shining by Chris. Bookmark the permalink.